Lady just had a full brother to Kieron, her 2013 cria! He looks the exact same, a show stopper!!! Our farm is so blessed to have aquired such a beautiful girl! Her photo's do not due her justice. We are excited to have Lady as the Foundation female for our Black line! Did I mention that she is 11/16 Accoyo? It is with joy that we welcomed our next True Black Herdsire in to the world on July 20th 2013! Sir Lord Kieron was born completely unassisted, by the time we found him at 9:15 am he was completely dry and had already nursed. 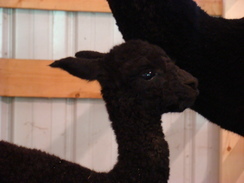 He is the first cria out of our foundation True Black girl AGO Lady Obsidian. His Sire is 19x Color Champion True Black Avalon's Jacob Black. His fleece is so soft and curly! We cannot wait to show him in the spring of 2014!! Watch out for him at the spring shows! He is going to be a show stopper! Stay tuned to this amazing True Black male! Update! His fleece just keeps getting better! It is so dense, crimpy, fine and bright!! He is going to be high in the ribbons! 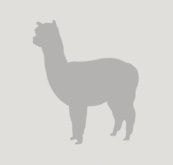 Cannot wait until he is producing cria of his own! We have his first cria on the ground and it is a Grey FEMALE, Elora Mae! 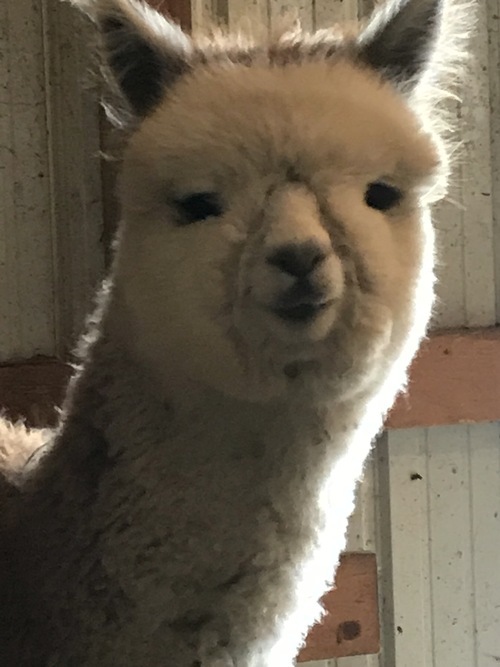 His second cria was born this summer and it is a Dark Fawn Male, to our female Breaze our 2x champion white female, his name is Summer Tal. He is bright, fine, crimpy, and dense! 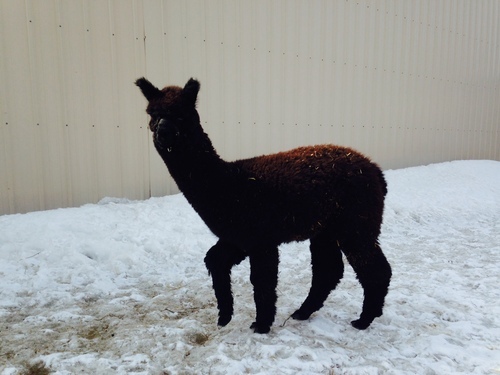 We can not wait to see him mature, he might just be the next herdsire on our or your farm!